Hi y'all! I want to tell y'all about something I use in my class that has dramatically helped both my struggling readers and my kinesthetic learners....it's called "jumping sounds!" I teach phoneme segmentation using these handy cards and color-codes [check them out here] Green for the initial sound, yellow for the medial sound(s) and red for the final sound. I have a lot of kinesthetic learners in my class, so I bought these mats at the Dollar Tree for $1. I put these mats down on the floor and let my little scholars jump on each color as they said the sounds in the word. This idea kind of morphed when working with my struggling readers one day during small group reading (our small group includes phonics and guided reading components). Many of my students have no problem reading the letter sounds individually within a word, the difficulty lies in blending them together. 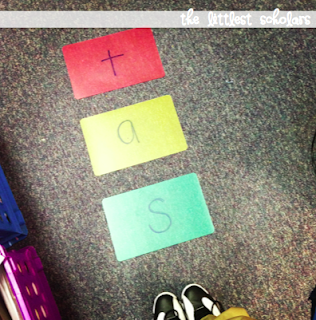 I used the same green, yellow, and red mats but added the letter sounds to them! I write the sounds of the 3 phoneme word on the chopping mats with dry erase markers. My little scholars literally jump on the letter sounds as they stretch them out to read the word. We do this several times and then go back to the table to read that word in the text. This kinesthetic approach has really helped my struggling readers and they certainly remember how to blend the letter sounds when they encounter that word in the text. I'll often leave the mats down all day and I'll find a line of my little scholars waiting their turn to "jump the sounds!" You can modify this idea to use in your classroom in a variety of ways. You can just use the colored mats (with no letters written on them) to teach phoneme segmentation, you can "jump syllables," you can blend 4 of 5 phoneme words -- just add a few more yellow mats! For more ideas and to connect with other teachers, join our Facebook group! What a great find at the dollar store. Thanks for sharing. Great idea! First off it's great to see another Mississippi teacher blog! I wish I had seen your blog when I was taking my Early Literacy class - this would have been a wonderful activity to incorporate into my presentation! I'm working with the older guys now (field experience in college), but what a great activity! Thank you so much for posting this FABULOUS idea! I am always looking for new ways to teach blending and segmenting. It can be such a hard skill for some students and this is a fun way to get the students up and moving! 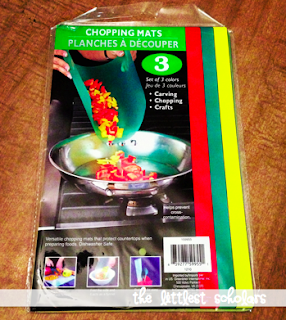 I plan to go to my local dollar tree and get these mats (or make them on my own with paper and lamination) and try this activity once I get back to school (it is my spring break:). I love how you incorporate colors, movement and pictures. Thank you! Clever and fun idea! Some of my Pre K kids are starting to read. This is perfect for them! Thanks for sharing and thanks for posting on my "new" blog. I'm glad you found me so I could find you! I also use sound boxes on the floor and I also use the green, yellow, and red boxes. I have colored tape to distinguish between them, but the tape doesn't stick to the carpet very good. I've been looking for something else in those colors; I'll have to check out our Dollar Store for the mats. Are they eraseable when you write on them so you can change the letters/words?